On October 6th 2016, the Parliament of Catalonia designated the 17th of September 2017 as the date in which the population of that region are to vote in a referendum to determine whether to remain as part of the Kingdom of Spain or formally assume the status of a sovereign country. Catalonia’s Regional President Carles Puigdemont made it clear that though he would ideally hold the referendum with the central government’s approval, he would hold it “with or without Spain’s blessing.” For its part, the central Spanish government which is based in Madrid has voiced its opposition to the prospect of Catalan independence as apart from the undermining of territorial integrity, it would mean losing a sixth of its population, and a key economic contributor to the stagnant Spanish economy, in which some approximate 22 percent of the population are unemployed. But what would Catalan independence really mean? In the context of financial flows between Catalonia and Spain, as well as international trade, globalisation, the EU, NATO, and cultural confluences between the two entities, would Catalan independence be a mere formality? In other words, has the Catalan Question been relegated to the symbolic by these twenty-first century forces? The question of Catalan independence is as old as Spain itself. Having been originally independent as the County of Barcelona, it was merged with Aragon in the 11th century, (and – ironically – served as an important launch-pad seaport that allowed Aragon to become an important seagoing nation, and an important naval power in the Mediterranean and eventually subdue other nations such as Valencia, which is still a part of Spain) which itself in turn was merged with Castile in 1469 in the personal union that arose from the marriage between King Ferdinand of Aragon and Queen Isabella of Castile that birthed the Kingdom of Spain. In the following five centuries, perhaps the most tumultuous and unstable in Spain’s history (enduring a war of succession, occupation by Napoleonic France, civil war, no less than two coup d’états and restorations), the Catalan province enjoyed unpredictable relations with the Crown of Spain. To begin with, in the early 18th century, with the death of the childless King Charles II, Spain had a new King whom Catalonia had opposed in the 12-year war of succession (1702-14) in Louis XIV’s grandson, Philip V, the ancestor of the Spanish branch of the Bourbon dynasty, which retains the crown of that country to this day. In the ensuing years of his reign, King Philip energetically enacted “Spanification” attempts that saw him clamp the relative regional autonomy that the various medieval kingdoms such as Catalonia had enjoyed – with the exception of Basque, which had supported him in the war – and began a process of centralisation along the lines of what Cardinal Richelieu and later Louis XIV had done in France. He also established a Royal Academy that perhaps in retrospect came to be the agitating cause of the desire for independence among the Catalans as its implicit foundational mandate was the replacement of various regional languages, including Catalan, as languages of government and of literature in their respective territories. Between 1931 and 1939, with the fall of the monarchy and the rise of the (second) Spanish Republic, Catalonia once again enjoyed regional autonomy and was even self-confident enough to declare independence under the charismatic Francesc Macià i Llussà in 1931, only to later renegotiate its relationship with Spain and become a greatly independent Generalitat de Catalunya within Spain a year later. With the victory of General Francisco Franco in the Spanish Civil War (1936-39) came many reversals to the autonomy of Catalonia once again. The conservative, fascist government, which had won the war partly as a result of assistance from Hitler’s Germany and Mussolini’s Italy, enacted measures that once more rolled back regional autonomy, and went as far as to ban regional languages from public use. However, the transformation of that relationship may prove somewhat vacuous. What is interesting is the economic side of the story. For a considerable number of Latin American countries, Spain is their second-largest trading partner outside of the more economically and politically potent and geographically closer US: Spain enjoys particularly strong economic ties with Mexico (18 percent), Colombia (13 percent), and the Central American economies, and in 2014, a total of 19.6 percent of Spanish FDI flowed to Latin America. To put it in context, about 40% of Spain’s FDI for the same period was towards the EU with whom Spain has much more formalised ties thanks to the common tariff. Being “heavily reliant on Spain’s Treasury credit lines,” according to CNBC’s Caroline Roth, Catalonia, much as the secessionist elements would have it otherwise, is unlikely to be rid of that dependency for a long time; and should political independence be won, the economic one will merely take a different form. Indeed, former colonies (as no doubt many pro-independence politicians would characterise Catalonia’s status in Spain) tend to have notoriously resilient trade pathways with their former colonisers. Spain as a market is a very important one for Catalonia. In 2012, for example, Catalonia exported goods worth €58,282 million to foreign countries; a figure well in excess of sales to the Spanish market, which amounted to €49,026 million, but one which, at 45.7%, signifies Spain’s importance to Catalonia. “A key aspect to consider in our analysis is the presence in Catalonia of numerous Spanish companies, for whom the Catalan market represents between 15% and 25% of the Spanish market as a whole. The ten Spanish firms with the largest turnover are: Telefónica, Repsol, Santander Bank, Endesa,Iberdrola,ACS Group,CEPSA, BBVA, Mercadona and El Corte Inglés.Most of them are present on a large scale in Catalonia,” stated Francesc Raventós who served as Chief Executive Officer and Director at Catalana d’Iniciatives S.C.R., S.A., in a report published by Association of Economists of Catalonia on September 11, 2014 (Catalonia’s national day). 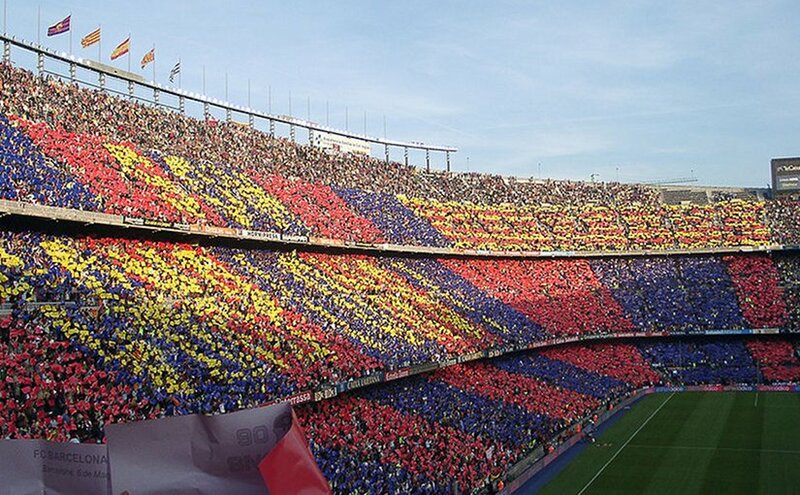 FC Barcelona’s stadium Camp Nou. Photo by DJ Lucifer, Wikipedia Commons. On the cultural front, apart from Catholicism (which represents a religious uniformity not even England can boast regarding Ireland and Scotland), the key commonality between Catalans and Spaniards is the social currency of football; their two respective flagship teams being among the best in the world: FC Barcelona and Real Madrid FC, respectively (Barcelona currently being 2nd and Madrid 1st). FC Barcelona has a presidency and a substantial number of players who wish for Catalonian independence, a fact which triggered the president of the Spanish Sports Council, Miguel Cardenal, to come out and state that Barcelona would lose a lot of income from the loss of La Liga broadcasting rights. And for their part, the pro-independence elements in the soccer team would like to continue to be able to play in La Liga. “[On this issue] perhaps a compromise is possible,” said Jan Marot of Politico. Should independence be won, it is highly probable that the Together for Yes coalition, which was born out of a desire to deliver independence would lose its mandate (as has UKIP in the UK, some argue, after Brexit) and become divided on the nuts and bolts of what independence should mean, not in the least as it pertains to the relationship with Madrid, as well as with Brussels. As it stands, the party with the highest number of seats within the coalition is the pro-EU Catalan European Democratic Party, with its junior partners having no particularly consequential Eurosceptic views. On the other hand, apart from the Eurosceptic CUP, most of the other parties who compose the rest of the Catalan Parliament, including the 32-seat Citizens Party, are pro-EU. And so, in the event of independence, it is likely that Catalonia would not completely rule out membership in the EU, and therefore concentrated economic, political, and even human exchange with Spain. Come September 17th, I am not sure what the Catalan people will choose, and there is evidence that they are not yet either (the 80% who voted for independence in the 2014 referendum were less than 50% of Catalonia’s population; and despite their parliamentary majority, Catalonia’s separatist parties garnered only 48% of the popular vote), and what Spain will make of it; though there is clear evidence that the pro-independence camp has the edge and Madrid will have few choices outside of recognising the outcome. Essentially, it would appear that what Catalonia wants from Spain has already been granted to it in that the region enjoys formal autonomy from Madrid and has a distinct culture for which its people are not persecuted (though pledging loyalty to the Bourbon King continues to be a sore subject). From the football pitch, to questions of human settlement (think India and Pakistan in 1947, though perhaps with far less bloodshed and urgency), security issues, as well as the economy, should independence be won, the existence of the deep ties between the two entities will – as they are being unravelled – become more and more visible (if not retightened anew, as was the case in the early 1930s). It is quite clear therefore that, for better or for worse, there will always be Spanish Catalonia, and for that matter Catalan Spain.